Whenever we have potatoes sprout in the cupboard, we plant them out in a spare garden bed. 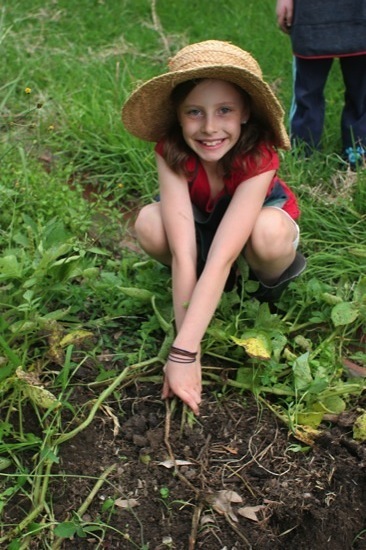 It costs nothing, and you typically get back about 5-10 times as many potatoes as you plant! Potatoes are also amazing for establishing new garden beds. They break up the ground, attract lots of worms, and leave a lovely rich soil behind. 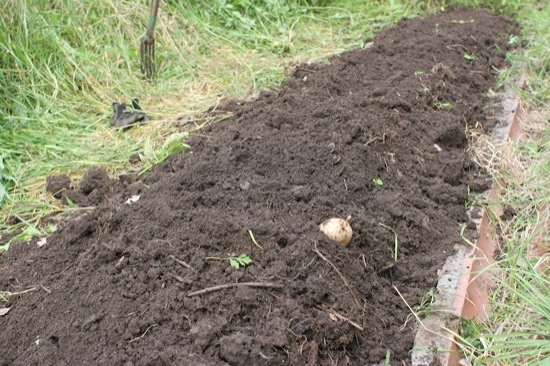 I use the standard potato-growing technique – dig a fairly deep trench (up to a foot deep), put the seed potatoes in the bottom, and cover them with an inch or so of dirt. As the shoots start coming through, keep backfilling the dirt around them. Keep hilling and mulching them until you can’t go any higher, then leave them until the tops start to die off. Finally, dig! The girls gave me a hand pulling up our most recent potatoes last weekend. It’s like a treasure hunt! Every time I turn over the soil, the girls rush in and try to outdo each other. 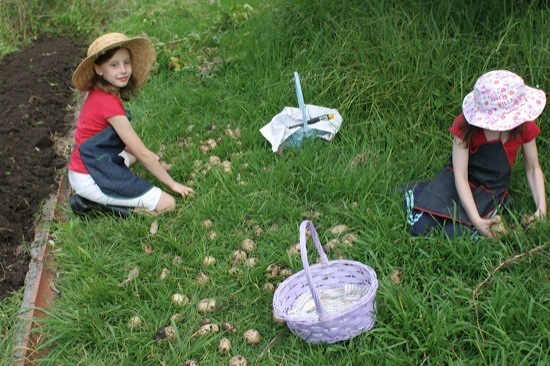 There’s always a bit of competition to see who can collect the most potatoes. After they’ve all been recovered, we brush the clods of dirt off the potatoes, sort them (use any damaged ones first), and let them dry a little in the sun. Look at that lovely rich soil left behind! There were heaps of worms all through the garden bed. The end result – a big tub of potatoes. 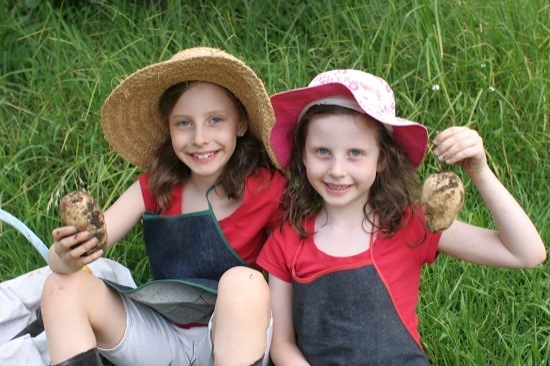 We collected about 12 kg, having started with about 1 kg of sprouted potatoes from the cupboard. Not a bad return! They were all a lovely big size too – sometimes you get lots of little ones, but not this time. 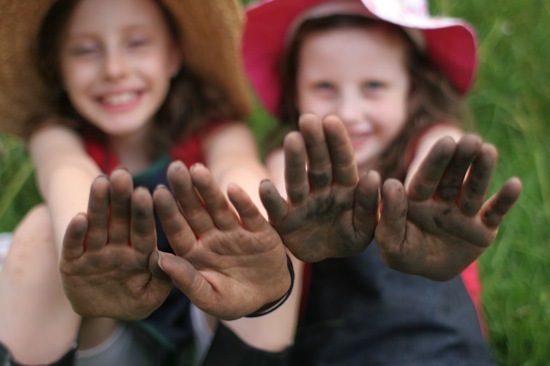 And of course, the girls were proud to have gotten their hands dirty helping Dad! We’re fortunate here on the South Coast. 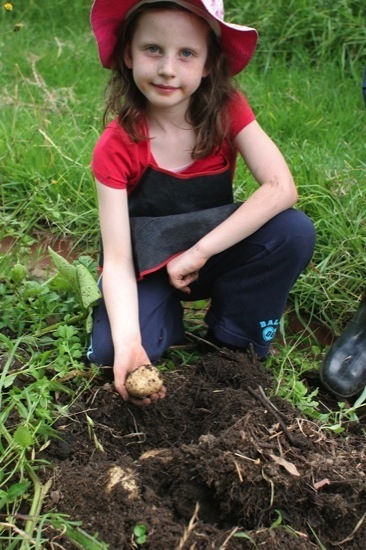 Our climate is mild enough that we can plant potatoes pretty much any time of the year. Gardening web sites tell you to plant them between August and October; that may give you the best yields, but really they’ll grow anytime the soil is above 10C (50F). If you have potatoes sprouting the cupboard, you’ve got nothing to lose by planting them out! Do you grow potatoes? Do you have any special techniques to share? I’m still getting potatoes from spots I planted 3 and 4 years ago! @Frogdancer: Hehe, that happens to us too! I’ve got purple spuds popping up in various garden beds at the moment. We are planting them for the first time this year. My girls and I are experimenting: a few in pots where we keep piling soil onto the plant, and a few in a trench. We do find Jerusalem artichokes popping up everywhere, but that is a ative in my region. @Frank: Sounds good. I just planted some Jerusalem artichokes, so hopefully I’ll be eating them by the end of summer! I love low-maintenance crops like these :-). Hey Darren, what good workers you have. And yummy spuds too…..I still have some growing in a nice tall mound……and still have seed to plant..I just need to make more room..lol. @nellymary: They can be good workers, if you can find the right motivation :-). I’ve got another bag of spuds going to seed in the cupboard, so I’ll be planting those ones out soon (and eating the lovely fresh ones!). I thought growing potatoes sounded like too much hard work – sourcing virus free tubers and then all that digging. 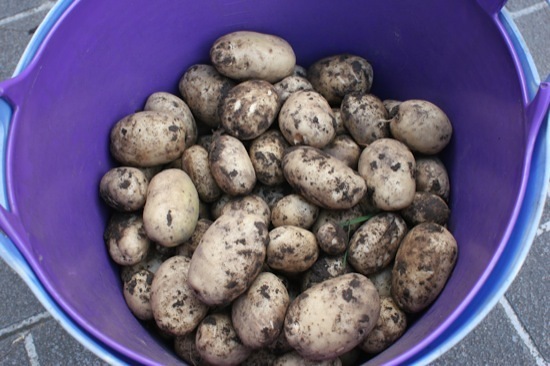 I threw some sprouted potatoes into my compost heap to get rid of them, and when I went to pull out an unfamiliar plant – attached to it were 5 small new potatoes. I’m going to try this lazy method again, and maybe use lawn clippings to mound up around the plants as they grow. @Mandy: I just planted some more today – again, they were bought ones that sprouted in the cupboard. This time I lined the trenches with torn up comfrey leaves before backfilling, as I’d heard that they really help potatoes get off to a good start. I’ll see how it goes! I am totally fuelled to do this now. My girls will love this – what great fun. @Ali: Go for it! We’ve just put in another bed, and the plants are just starting to peep out through the soil. We’ve only got a kilo or so left from the last batch now. Tickle me tattoes…that’s what I and my husband do…there are only 2 of us (and a cat) so when I need potatoes I burrow down with my hands under the plant and just get a few for tea. I also grow kumura (sweet potato) so easy too. Just watch out though because they can take over the vegetable patch. @Julie: We do that a bit too – we call it “bandicooting”. I’ve got a fair bit of sweet potato growing now – it’s a good ground cover in bits of the garden that you’re not really using. They’re very productive! I’ve got some Jerusalem artichokes growing again this year. I had them at our old house, but they didn’t survive being transplanted here. They seem to be doing well, so hopefully I’ll be able to get a permanent patch established. They’re pretty good for mulch, as well as the tubers. oh you have such lovely girls! that’s such a cute post, I’ve never dug potatoes myself, got no experience to share, but one day if i can, I would love to! back home in singapore where we had a back garden, we planted sweet potatoes, though it was for their leaves (tastes like spinach but better imo). @Shuhan: Thanks! They can be cute when they want to :-). We’ve got lots of sweet potatoes growing as well – we eat the tubers, but while I know the leaves are edible we’ve never tried them. I’ll have to give it a go next time I do a stir fry!